New Zealand has an abundance of natural produce to make your mouth water. Shop for the best picnic supplies from the array of organic fruit and veggies at the local farmer’s market in Hawke’s Bay. Enjoy a relaxed dinner of fish and chips on the wharf in Mapua whilst listening to live music and enjoying a craft beer made with locally grown Nelson hops. Follow your nose to some of the best independent coffee roasteries in the world in the backstreets of Wellington. Discover the famous vineyards of Marlborough and many less well known areas such as the laid back, sleepy town of Martinborough. Experience a tastebud sensation with a long lunch at a vineyard in Waiheke; top class food and wine combined with sensational views over the Hauraki Gulf. On arrival into Auckland, you will be greeted at the airport and transferred by private vehicle to the accommodation of your choice. After a long flight it is recommended to get outside and stretch the legs; thankfully there is an abundance of wonderful locations around the city for such an activity. 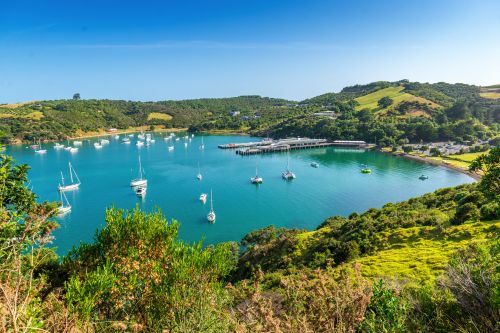 There has been an incredible buzz about Waiheke for a number of years now; locals knew of its existence, locals loved what it had to offer and then all of a sudden the world stood up and took notice. Stoneyridge Vineyard and the foresight of its founder Stephen White played an enormous part in this, as did Lonely Planet, recently voting it the 5th best region on the planet. With more than 20 vineyards on the island, there is something for everyone and the relative close proximity to each other makes it ideal for touring around. There are also numerous world-class restaurants to help pair your favourite wine; not to mention the unrivalled scenery and friendly atmosphere that abounds. You will be forgiven if you find you never want to leave. 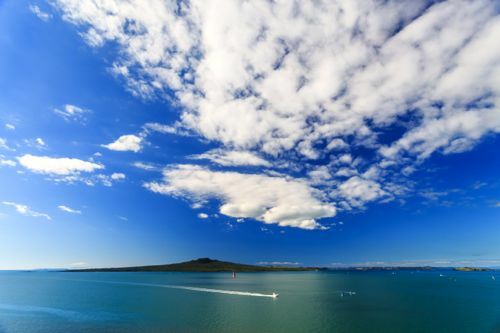 This morning you will make your way to Auckland airport and take the short flight down to the east coast of the North Island and New Zealand’s oldest wine growing regions. With its coastal location and climate, and sitting at the latitude it does the wines produced here are similar to that of Bordeaux. Full bodied reds dominate, as well as complex Chardonnays; aromatic whites are consistently good, and the planting of Pinot Noir in certain areas is yielding great results. There are numerous options for touring around the grapes in this part of the world, and if luck is on your side you may well time your visit to coincide with any number of musical or cultural events that are hosted at vineyards in the region. Most of the cellar doors are in close proximity, close enough to make cycle touring between them possible and comfortable. If this is not for you, or you want to visit a specific vineyard outside a comfortable cycling area then half and full day tours can be arranged. 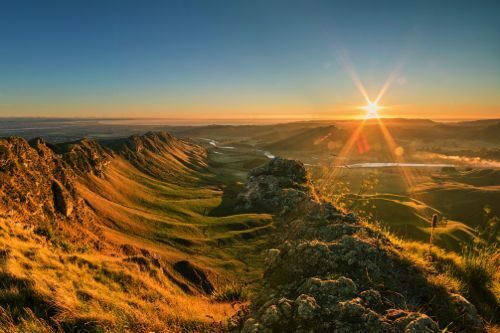 Today you pick up your hire car and make your way 3 hours south to the town of Martinborough; home to around 20 vineyards, most of which are within walking or cycling distance from the village square. Martinborough is a delightful town with some remarkable colonial architecture and a unique street layout, which resembles, to some extent the Union Flag; however, it is the vineyards that are the real drawcard here. The town just so happens to share very similar conditions to the famous Burgundy region of France, with like for like temperatures and rainfall, and free-draining river gravels, making it an ideal place for cool-climate wines. 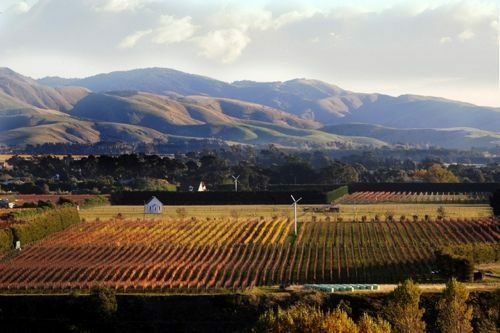 Pinot Noir is Martinborough’s flagship wine; however, it is also home to distinctive Sauvignon Blanc, full flavoured Chardonnay, Riesling, Pinto Gris, and gentle Rhone-like Syrah. This is the perfect place to slow the pace right down and stroll from cellar door to cellar door, all the while taking your time to enjoy the stunning surroundings. It is only a short drive up and over the Rimutaka Ranges and down into New Zealand’s capital city, which is a foodie’s dream, with exceptional eateries at every turn and a craft beer revolution that is taking the country by storm. With creative individuals like Tuatara’s founding father Carl Vasta, described as “an engineer with the taste buds of a wine critic”; Garage Project who once released 24 beers in 24 weeks; and ParrotDog who recently crowd-funded a new brewery in less than 24 hours it is hard not to have the appetite whet for a creative brew. It is not only the food and craft beer scene that has people talking; nowadays Welly (as it is known in New Zealand) is much, much more. From the world-class national museum Te Papa; to the Weta Workshop, where you can see how Lord of the Rings was brought to life; and the biosphere Zealandia, host to some of New Zealand’s rarest wildlife, there is something for everyone. And if you want to see how New Zealand is governed then a free tour through the Beehive provides a great insight. 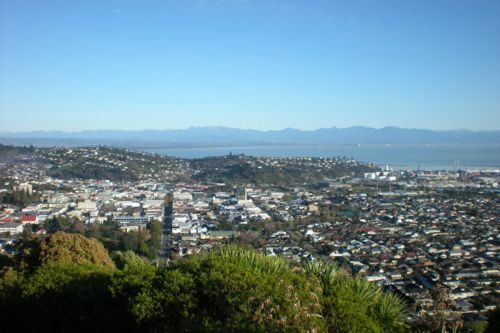 You will take the early morning Inter-islander ferry, which departs from downtown Wellington. This is a fantastic way to get to the South Island via the Cook Straight and the undeniably stunning Marlborough Sounds. Docking in the quaint seaside village of Picton you will make your way over to Blenheim, which is in the heart of the Marlborough region, nestled amongst endless vineyards and blessed by one of the warmest and driest climates in the country. 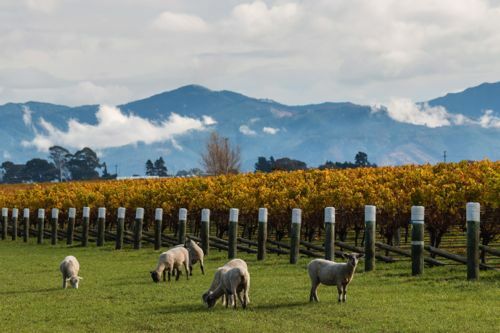 The top attraction in the area is wine, wine touring, wine tasting and anything to do with the industry, and with good reason; Marlborough consistently produces more than 75% of all of New Zealand’s wine. The area, consisting of the Wairau Valley, Awatere Valley, and the Southern Valleys is New Zealand’s flagship region and it’s Sauvignon Blanc put the country on the international stage. There are numerous options for touring, tasting, and enjoying the region; full and half-day tours can be arranged. The destination today is Pohara, a drive of some 3.5 hours across a varying landscape of vineyards, native bush, hop growing country, coastal areas and the famous Takaka Hill. Take your time and soak up what is on offer. Stopping in at Mapua for fish and chips on the wharf whilst watching the world go by is a highlight, as is the small town of Motueka; but the real star of the day is Pohara and the Golden Bay area. 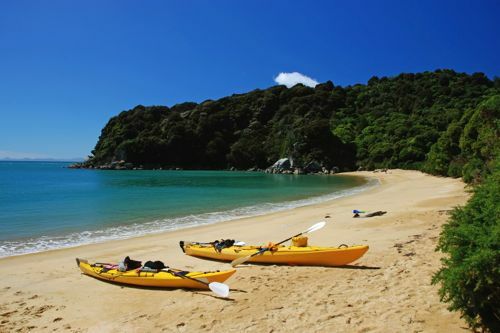 From your base in Pohara you will be able to explore the Abel Tasman National Park, by kayak or on foot; guided tours here are recommended and can be arranged. A trip to the end of the road, or at least to Collingwood is also a wonderful way to spend a day, perhaps with a picnic hamper in tow. And not to be outdone by the countries capital, the Golden Bay has a fantastic craft beer scene, which can be appreciated in Onekaka’s famous Mussel Inn. The beauty of the Golden Bay is something that is hard to describe and an area that most people, Kiwis included, only ever dream of! 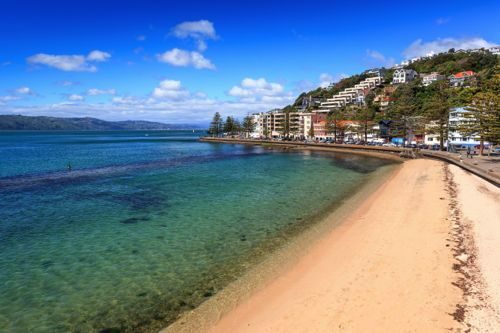 Nelson is the final destination on your adventure in New Zealand. On the drive back from Pohara, perhaps stop in at any places you missed on the way over. It’s likely you will get Nelson early enough to spend the best part of the day soaking up this wonderful small city and its surrounds. Visit the geographic centre of New Zealand, one of the many galleries that dot the city or enjoy an afternoon of gentle cycling along the coastal cycle trail. Make your way to Nelson airport where you will drop off your hire car and board a flight to Auckland and then onwards to your destination.